Carlisle are on the brink of a Wembley return after a stunning victory against Huddersfield in the Johnstone's Paint Trophy Northern Area final first leg. Last year's beaten finalists took the lead when Ben Marshall fired home from Francois Zoko's flick-on, before Tom Taiwo's 20-yard drive added a second. The visitors offered little in return and were helpless as Peter Murphy powered in a header from a corner. And Lubomir Michalik added the gloss, heading in James Berrett's free-kick. The scoreline did not flatter a buoyant Carlisle side, who could have scored further goals but first Craig Curran and then Michalik had efforts hacked off the line. Huddersfield's best chance fell to Jordan Rhodes, but he was unable to get his shot away, with Murphy's goal-saving tackle timed to perfection. "The performance was absolutely terrific. Today there were three or four players who probably had their best games of the season. "We were first to everything tonight. I thought we deservedly won by four, on another day we might have actually finished the game and the tie completely off, we might have had one or two more. 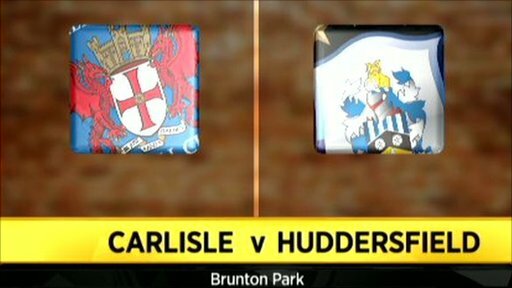 "If there's one side that's capable of turning it round, it will be Huddersfield. The tie's not dead, but we've kept a clean sheet and we've got a four-goal start." "There was not a plus point to take out of it, but I'm the manager and I take full responsibility. "We get back on the training field and work hard - never mind a wake-up call, this is a car crash incident so we need to heed the warnings and we need to put it right as soon as possible. "We were totally outdone in every aspect of the football match tonight." 90:00+4:16 The final whistle is blown by the referee. 90:00+3:15 Substitution Danny Livesey joins the action as a substitute, replacing Liam Cooper. 90:00+2:35 Corner taken left-footed by Gary Roberts, Francois Zoko makes a clearance. 90:00+1:06 The ball is swung over by Kevin Kilbane, save made by Adam Collin. 88:37 Close range headed effort by Jordan Rhodes misses to the right of the goal. 87:49 Alan Lee fouled by Liam Cooper, the ref awards a free kick. Anthony Pilkington restarts play with the free kick. 87:49 Substitution (Huddersfield) makes a substitution, with Joey Gudjonsson coming on for Lee Peltier. 86:43 Francois Zoko sends in a cross. 85:02 Anthony Pilkington takes a shot. Save by Adam Collin. 84:19 Foul by Alan Lee on Lubomir Michalik, free kick awarded. Direct free kick taken by Adam Collin. 83:08 Alan Lee concedes a free kick for a foul on Lubomir Michalik. Free kick taken by Adam Collin. 82:16 The ball is crossed by Gary Roberts, Header from close range by Kevin Kilbane misses to the right of the goal. 81:33 Free kick awarded for a foul by Francois Zoko on Peter Clarke. Gary Roberts takes the free kick. 80:25 Ben Marshall gives away a free kick for an unfair challenge on Lee Peltier. Anthony Pilkington takes the direct free kick. 80:02 Kevin Kilbane crosses the ball, Ben Marshall makes a clearance. 78:52 Effort on goal by Ben Marshall from just inside the box goes harmlessly over the target. 77:23 Craig Curran takes a shot. Blocked by Tom Clarke. 76:38 James Berrett takes the outswinging corner, clearance made by Tom Clarke. 75:20 Anthony Pilkington takes a shot. Save made by Adam Collin. 75:05 The ball is sent over by Kevin Kilbane. 71:42 Booking Booking for Lubomir Michalik for unsporting behaviour. 69:55 Tom Taiwo concedes a free kick for a foul on Gary Roberts. Anthony Pilkington takes the free kick. 69:17 Antony Kay challenges James Berrett unfairly and gives away a free kick. Lubomir Michalik takes the direct free kick. 68:45 Gary Roberts sends in a cross, Lubomir Michalik makes a clearance. 67:38 Jordan Rhodes crosses the ball, clearance by Liam Cooper. 65:05 Kevin Kilbane challenges Frank Simek unfairly and gives away a free kick. Lubomir Michalik takes the direct free kick. 64:02 Handball decision goes against Gary Roberts. Assist on the goal came from James Berrett. 64:02 GOAL - Lubomir Michalik:Carlisle 4 - 0 Huddersfield Lubomir Michalik finds the net with a headed goal from close range. Carlisle 4-0 Huddersfield. 62:45 Substitution Lee Novak goes off and Alan Lee comes on. 61:43 Outswinging corner taken by James Berrett from the right by-line, the assist for the goal came from James Berrett. 61:43 GOAL - Peter Murphy:Carlisle 3 - 0 Huddersfield Goal scored by Peter Murphy from inside the penalty box low into the middle of the goal. Carlisle 3-0 Huddersfield. 59:38 Substitution Scott Arfield leaves the field to be replaced by Gary Roberts. 58:03 Lubomir Michalik challenges Peter Clarke unfairly and gives away a free kick. Ian Bennett takes the free kick. 57:45 The ball is delivered by Ben Marshall, Craig Curran takes a shot. Blocked by Antony Kay. 57:21 Free kick awarded for an unfair challenge on Ben Marshall by Tom Clarke. James Berrett restarts play with the free kick. 56:11 Inswinging corner taken by Anthony Pilkington from the left by-line, free kick awarded for an unfair challenge on Ben Marshall by Scott Arfield. Adam Collin restarts play with the free kick. 54:13 Lee Novak has a header from close range and clears the crossbar. 52:53 Kevin Kilbane gives away a free kick for an unfair challenge on Tom Taiwo. James Berrett restarts play with the free kick. 52:53 Booking Anthony Pilkington receives a caution. 50:43 Free kick awarded for a foul by Francois Zoko on Lee Peltier. Lee Peltier restarts play with the free kick. 49:00 Free kick awarded for an unfair challenge on Kevin Kilbane by Francois Zoko. Free kick taken by Ian Bennett. 48:24 Free kick awarded for a foul by Jordan Rhodes on Peter Murphy. Lubomir Michalik restarts play with the free kick. 47:06 Unfair challenge on Lee Novak by Liam Cooper results in a free kick. Anthony Pilkington restarts play with the free kick. 45:00+2:05 The referee calls an end to the first half. 44:53 Liam Cooper is penalised for handball and concedes a free kick. Antony Kay takes the free kick. 44:13 Francois Zoko produces a cross, clearance made by Tom Clarke. 36:28 A cross is delivered by Scott Arfield. 34:24 Tom Clarke gives away a free kick for an unfair challenge on James Berrett. James Berrett takes the direct free kick. 34:11 A cross is delivered by Frank Simek, clearance by Tom Clarke. 32:11 Foul by Tom Clarke on Francois Zoko, free kick awarded. James Berrett takes the direct free kick. 31:02 Unfair challenge on Peter Clarke by Ben Marshall results in a free kick. Ian Bennett takes the direct free kick. 26:04 Effort on goal by Scott Arfield from just inside the penalty area goes harmlessly over the target. 25:03 Inswinging corner taken right-footed by James Berrett from the left by-line, Peter Clarke manages to make a clearance. 23:32 Shot from just outside the box by Craig Curran misses to the left of the target. 22:08 Francois Zoko provided the assist for the goal. 22:08 GOAL - Tom Taiwo:Carlisle 2 - 0 Huddersfield Tom Taiwo scores a goal from the edge of the penalty area to the bottom left corner of the goal. Carlisle 2-0 Huddersfield. 21:08 Kevin Kilbane fouled by Tom Taiwo, the ref awards a free kick. Direct free kick taken by Tom Clarke. 18:36 Tom Taiwo provided the assist for the goal. 18:36 GOAL - Ben Marshall:Carlisle 1 - 0 Huddersfield Ben Marshall finds the back of the net with a goal from the edge of the penalty box to the bottom left corner of the goal. Carlisle 1-0 Huddersfield. 17:02 Francois Zoko has an effort at goal from outside the penalty box missing to the wide right of the target. 16:24 Shot by Liam Noble from just outside the area goes over the net. 13:58 Ben Marshall crosses the ball. 13:21 The ball is delivered by Jordan Rhodes, save made by Adam Collin. 9:04 Antony Kay fouled by Francois Zoko, the ref awards a free kick. Direct free kick taken by Peter Clarke. 5:51 Frank Simek sends in a cross, free kick awarded for an unfair challenge on Ian Bennett by Craig Curran. Free kick taken by Ian Bennett. 0:52 The ball is crossed by Lee Novak.